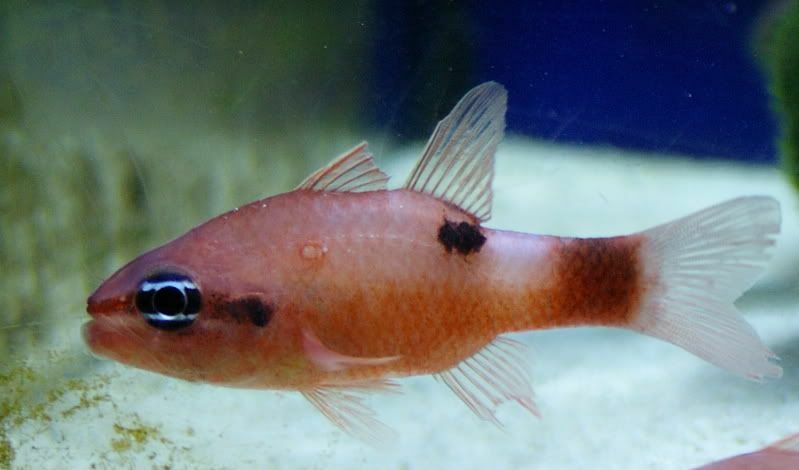 The Flame Cardinalfish (Apogon maculatus) is a beautiful fish and easy to care for. They tend to be solitary and should only be kept in pairs. They are reef safe but will eat ornamental shrimp if they are small enough. They grow to about 4 inches long and can open their mouth larger than it appears they can. It is possible to keep several of them in a large tank but they will not school. They like places to hide but they will readily swim in the open. Mine eat frozen mysis and have not shown much interest in flakes or pellets. I’ve kept them with other species of cardinalfish without a problem. They only seem to show aggression to their particular species.